We knew it couldn't be gone forever. With a deal so good that we were casually throwing around the phrase 'best SIM only deal ever', Three had to do a reunion tour of sorts, bringing the deal back for one more grand show - and now it has. What is this incredible deal we speak of? Well way back on Black Friday last year Three dropped an unlimited data SIM only deal for just £20 each month, undercutting the nearest competition by a fiver a month. And now it has graced us once more with its presence, and includes unlimited calls and texts, too. You can see this unbeatable SIM only deal below or go straight to Three's website to get it because really, if you're in the market for a new SIM, it won't get better than this. We would suggest not waiting around too long though. Judging by the promotional images Three has put up, this is just a sale and could be gone just as quickly as it re-arrived. The best SIM only deal ever has made a comeback! Completely unlimited access to streaming, scrolling and music on your phone for an entire year. The next nearest price when it comes to all-you-can-eat is £5 a month more, making Three the cheapest by a very very long way. Hurry before this deal goes. If you haven't already been won over by this amazing offer then you'll be excited to hear that Three doesn't shy away from offering up some extra incentives as well. Whether that be free exclusive prizes or extra roaming. 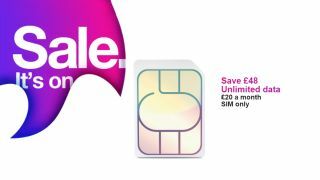 You can see all of best parts of a Three SIM only deal down below. Probably the only downside is that you have to commit to a whole year if you go for this offer. At £240 for an entire 12 months of all-you-can-eat data, texts and calls, we think it's still well worthwhile. But if you're a commitment-phobe who wants more flexibility to cancel, then check out Smarty's £25 per month unlimited data SIM that only makes you commit to 30 days at a time instead.